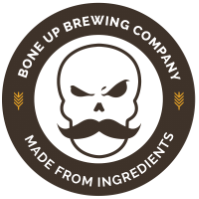 Stats: Jimbo Jaliper - Bone Up Brewing Co.
Color: Brassy, with a heart of orange. Food Pairing: Ribs. Memphis-style dry rub preferred, saucy baby back acceptable. Music Pairing (Jimbo's Choice): "You've Got a Friend in Jimbo" by Reverend Horton Heat. Music Pairing (Jared's Choice): "Jimbo Song" by Reverend Horton Heat. Best Occasion to Drink: Throw on some old-school Bill Murray movies (Eddie Murphy or Chevy Chase acceptable), grab a big ol' snifter of Jaliper, and enjoy your evening.